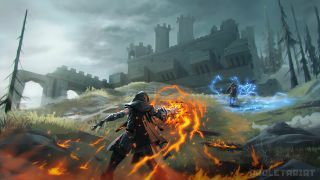 Combine elemental attacks in Spellbreak, a battle royale RPG now in closed alpha. How do you like the idea of battle royale with no guns? No weapons at all, even? Spellbreak is currently in closed alpha and it's a battle royale RPG featuring spell-casting mages who drop onto the map without so much as a blunderbuss. You scrounge for magical gear, potions, and spells, and then battle to the death as a circle (presumably a magic circle) closes around you. And after playing a bit, I have to say the magic system is so cool I find myself wishing it wasn't a battle royale game at all, but a traditional RPG. Or at least I'm hoping it will someday be an RPG in addition to being a BR game. It's really neat. You begin each match with nothing but a weak energy spell in each hand, and what you're looking for on the battlefield are gauntlets. These gauntlets contain elemental properties: wind, fire, ice, earth, lightning, and poison. With a wind gauntlet you can wave your hand at the ground and be propelled into the air, the fire gauntlet lets you fling a fireball, the poison gauntlet lets you spray a toxic pool of green goo. And so on. But the real joy of Spellbreak is in combining its various elemental spells. With a stone gauntlet you can do a ground-pound sending a fissure tearing across the map, damaging anyone in its path. If you have a fire gauntlet on your other hand, and your special ability is charged, you can lay down a flame wall, then drop a ground-pound right through it. Now the earth-shattering attack is a flaming fissure. So cool! Say, for example, you have fire and electrical gauntlets, and someone else has been shooting ice attacks at you, leaving frozen trails along the ground behind them. You can use fire to melt the ice into water, then electrify the water with your shock gauntlet, zapping anyone stupid enough to be standing in the puddle. With a wind gauntlet you can create a tornado that swirls around and pulls enemy into it, and with a toxic gauntlet you can fill that tornado with green poison. The stone gauntlet's alt attack can hurl a boulder that grows larger and more damaging the further it flies. Launch it over your wall of fire and it'll ignite. Or, zap it with ice while it's airborne, and wind up with the biggest snowball ever. The visual effects and sounds of the spells are all excellent, by the way, and it's hard not to feel like a mighty mage no matter what kind of spells you're throwing around (you can turn the sound on these gifs to hear for yourself). As if all the combinations of spells wasn't enough to consider, there are also multiple classes to choose from, each with a passive ability and a number of scrolls that provide various buffs. Take the ground-pound: your scroll might give it much greater range but slightly less damage, and make it rebound and head in a different direction when it hits a solid object like a tree or a wall. Other scrolls might give you immunity to certain effects, and one even lets you heal from standing in flames, which is damn useful if you're throwing walls of fire all over the place. As you play you unlock more scrolls by finding skill points or surviving long enough to enter the smaller and smaller rings of the closing circle. There's also magical gear in the form of different sets of boots, belts, and amulets, which also provide a myriad of different buffs. Plus, there are runes, which give you something of an ultimate power, including invisibility, flight, and even a Tracer-esque rewind power that brings you back to your location and health status from four seconds earlier. Honestly, there's a hell of a lot going on in Spellbreak, and there's tons to learn and remember as you're racing around picking stuff up. It's like trying to assemble the best RPG build you can from dozens of choices in a minute or two. Facing a big pile of loot glowing loot, it would be nice to have about ten minutes to decide what item goes best with what, but you've usually only got seconds. That's the nature of BR, but it feels trickier here. There's a pretty steep learning curve: it can be a bit hard to know what sort of gear you're picking up and what it does without stopping to examine it for a bit, which might get you killed. In a more typical BR, different guns have their own pros and cons but you can guess by glancing at a rifle or shotgun what it's gonna do when you point it at someone. It's harder here until you've learned what everything does, and what it can do when combined with something else. Luckily, there's a nice practice mode where you can try every item in Spellbreak, play around with them, and start learning how they work and how to recognize them at a glance. The other issue for me is, well, all the hopping. You can double-jump, and most fights I've had pretty much wound up being a contest at who was the best at hopping around to avoid getting hit. (Hint: it wasn't me, generally.) It's fine, really: it gives Spellbreak a fast and breathless pace that's important in BR. I guess when I think about wizards casting spells, I think of them standing toe-to-toe, deflecting spells as well as casting them, rather than bouncing around like jumping beans. On the plus side, you're pretty durable and I've had several skirmishes where I was able to retreat and heal up before mixing it up again. And there are a few defensive abilities that can be pretty useful. One class has a recovery talent, that lets you respawn immediately after death with half of your HP restored. The invisibility rune doesn't last long but it's good for a quick getaway. Spellbreak is good fun, and I'm enjoying it, but it's hard not to wish it wasn't just battle royale. It would be great to see this fun spell-casting system, and the wonderful art, animation, and sounds in full-on RPG, or even in some different PvP modes. Hopefully, someday, we will. You can sign up for the closed alpha here, and when it releases you'll find Spellbreak on the Epic Store.